Ok, so you've got a nice shiny die representing your class. That's all you need, right? Well, sure, we could leave it there, but that would be kind of dull. Instead we're going to jazz it up with a little bit of crunch that really shines a light on what a class does. At the highest level, class abilities provide a list of special exceptions of improvements on the normal rules that the class is capable of. A lot of these hinge on opportunities (when the GM rolls a 1) or on spending a plot point. As noted earlier, the normal limts on spending PPs are fairly restrictive, but classes represent the various exceptions to this. Something they can do by spending a plot point in response to an opportunity. Some sort of special ability. 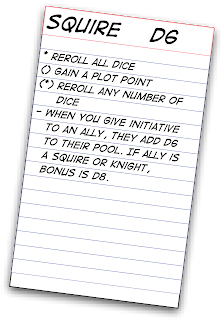 Teamwork: When the Squire gives initiative to an ally, they may add a bonus d6 to their pool. 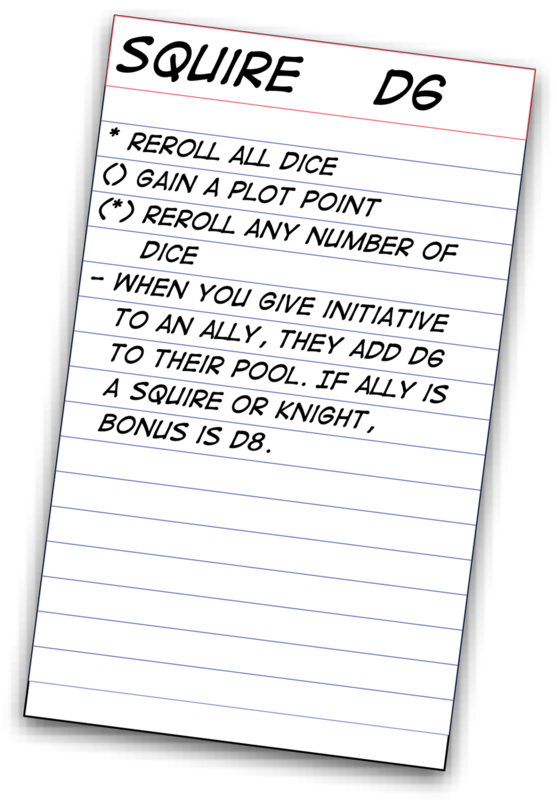 If that ally is a Squire or Knight, that bonus is increased to d8. 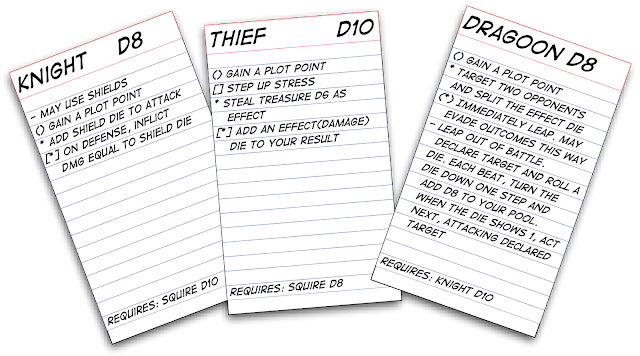 The squire is not a very sophisticated class - it's abilities are pretty much reroll driven, with the idea representing the young hero who survives through pluck and good luck more than power and talent, with a little bit of teamwork thrown into the mix. Bombs: The chemist may spent a plot point to create a d8 "bomb" asset, which may be of a type Fire, Ice or Lightning, and may be used as part of an attack. Opportunist: May take an opportunity to gain a plot point. Throw Potion: The chemist may use any potion in his inventory on any other party member without impacting intiative or taking a penalty. Potion Master: All potions used by the Chemist are stepped up one level. 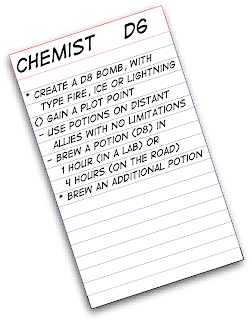 Brew Potions: Given an hour and a lab (or several hours and a traveling kit), the Chemist may brew a single potion of d8 potency. He may brew an additional potion for each PP spent. Ok, enough of that. Next we'll get onto the magic users and other weirdos. 1 - Most classes have the ability to gain a PP as a result of an opportunity. This is common enough to effectively be a default, but it's a class ability because it allows the design of more powerful classes which do not have that feature (and as such, must hit their distinctions hard to get PP). 2 - At this point I realize I may be getting ahead of myself on the rules here, since this requires some fair grasp of concepts from Leverage and/or Marvel Heroic. If it's not clear, "Take an opportunity" means "Take an action in response to the GM rolling a 1". it's entirely possible to take several opportunities on one roll. 3 - To give someone else a potion, you need to be near them (though that's mostly descriptive). Mechanically, you need to attempt to hand them initiative or take a penalty to your action. The Chemist ignores these problems. 4 - The Hunter is, I think, going to be able to contribute viscera to this process for bonuses. But I haven't quite worked that out yet. Agreed. Tactics is one of my favorite games, so it's great to see this in concept. Does it matter whether you win or lose for [*]? If not, it might make more sense if you use the symbol (*) instead. That said, that you looked closely enough to spot that problem too is a) gratifying and b) reassuring that (*) is the right tweak. So, thank you! The "Potion Master" ability ("All potions used by the Chemist are stepped up one level.") appears in the list, but not on the Chemist's card. "Most classes have the ability to gain a PP as a result of an opportunity." My concern is that this results in a cascade of 'bad luck' for the GM, as failed rolls add to the successes of the players. The exchange of 1PP for a Doom Die in MHR means that the balance overall is maintained for the most part. Absolutely true - player 1's matter too, but that's not material to the classes.